And the winner of the Best Inflight Connectivity Innovation award is… definitely the kind of topic that AvGeeks will appreciate. 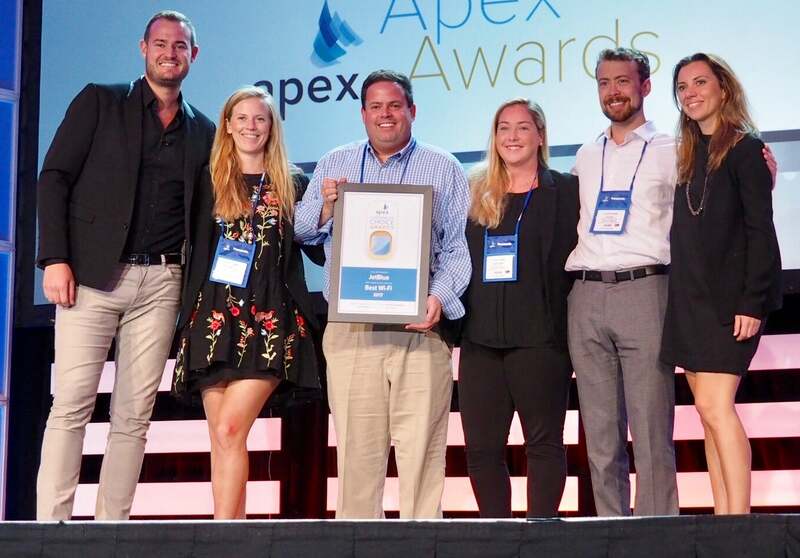 This and a dozen other awards were presented on Monday night at the Airline Passenger Experience Association APEX Awards in Long Beach, California. For those not familiar with it, APEX is the only non-profit trade organization in the airline industry. It comprises some of the world’s top airlines, industry suppliers, major media groups and aviation industry leaders. Its aim: to elevate the passenger experience while moving the industry forward with new initiatives and regulations. How do the awards work? Each category was judged by nearly 30 APEX members in the first round in order to select three finalists. Then, a final round of judging was completed with a live judging panel composed of industry media experts. And the host at the event this year? None other than TPG himself. In addition to the APEX Award winners above, APEX also honored a few other categories with its Passenger Choice Awards — tallied from passenger-submitted data on the Tripit app. APEX awards these awards in five categories. JetBlue accepts the 2017 Passenger Choice Award for Best Wi-Fi. Congratulations to the winners of the 2017 APEX Awards. Featured image from the 2016 awards by APEX.